New research suggests an answer to the mystery of how polar bears survived previous eras of low sea ice. But the same paper, published Tuesday in Frontiers of Ecology and the Environment, says the bears aren't likely to be able to rely on the same solution again. Washington, who co-authored the paper with Ian Stirling from the University of Alberta. Genetic research says polar bears diverged from other bears at least 150,000 years ago. That means the species lived through several low-ice periods, including a major warm period about 130,000 years ago. At that time, while some year-round sea ice is thought to have remained, total coverage was greatly reduced and mostly found in the very highest reaches of the Arctic. Despite the bears needing sea ice to hunt fat-rich seals, somehow they survived. Laidre and Stirling theorize those long-ago bears made it through an extended period of low ice by scavenging whale carcasses washed up on Arctic beaches. "Polar bears likely survived those periods by accessing stranded marine mammal carcasses, and most likely large whale carcasses," Laidre said. "They're such large carcasses that they can be packages of food for, in some cases, years." The researchers calculated that a population of about 1,000 bears would need about 20 bowhead whale carcasses to remain healthy through the spring foraging season and about eight carcasses during the summer, when the bears eat less. They then looked at mortality rates of large whales and what percentage of them might float long enough to wash up on a beach. Those numbers matched well with observed numbers of whale carcasses found in various parts of the Arctic. A stretch of Russian coastline along the Chukchi Sea, for example, averages about 10 carcasses a year between July and November. A small number of polar bears have learned to rely on that resource. The numbers suggest that washed-up whales could have been at least a major supplement during poor seal hunting conditions — especially since polar bears are very good at feasting on and storing fat. "I think they were very likely the main source of nutrition," said Stirling. 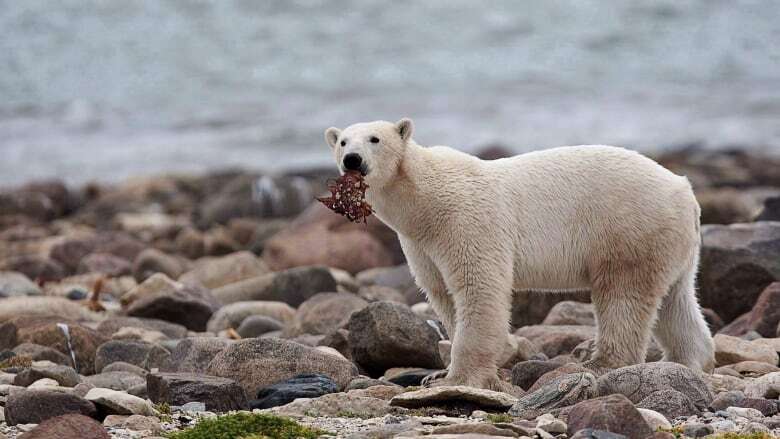 The future of modern polar bears in the face of rapidly shrinking sea ice is much debated, with some arguing their survival through previous low-ice periods bodes well today. Laidre and Stirling aren't so sure. The pace of change is much faster today than in the past. Bears don't have much time to learn new behaviours on a wide scale. As well, there aren't as many whales as there used to be. "Most of the whale populations have been overharvested," Stirling said. At best, he said whale carcasses could buy bears a little more time. "We may have a little bit longer timeline. Hopefully, we'll get climate warming under control. "For the various different species that depend on a polar ice ecosystem, we may be able to keep some of that in its natural condition."